Warning, this is a picture intensive post. Will you just look at this! I received this gorgeous pinkeep from Carolyn in the US this morning just as I was sitting down to my toast and marmalade. 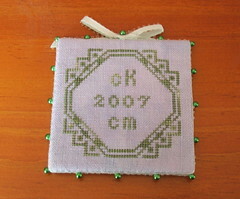 Carolyn received my name to stitch for in the Spring Quaker Exchange on the Stitching Bloggers Exchange Board. 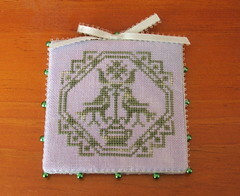 We had to stitch a Quaker motif using green and purple fibres or fabric. Carolyn also sent a lot of extra giftys with the pinkeep. She sent some beautiful threads (DMC, Gentle Art and Stranded by the Sea), some marking pins, some dressmaking pins, some finishing fabric, a journal and a notepad. You can see a pic of it all here. I am overwhelmed by her generosity. Thank you, Carolyn! 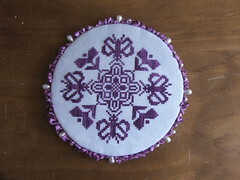 I also heard this afternoon that Yuko in Japan has received her Spring Quaker that I stitched for her. As usual, the motif is from the Ackworth School Pattern Book, I thought the “Butterfly” was pretty springy. It’s stitched on Olive Grove Lugana from Stitches and Spice with Gumnut Silk. I know I sent along some Gumnut silk along with the package and a card but that is all I can remember. (Yuko said I sent some needles? – I don’t remember slipping them in!) You can see a picture of the back (not that impressive compared to the front) here. 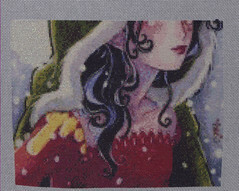 Lastly I have been stitching all day on Winter ACEO as it is Quick Stitch Wednesday on the HAED Board . I have managed to finish another page. Huzzah!! Frankly, there is no better feeling! I’m off to feed the dog and then I think I’ll settle down to work on Geranium House for a bit.